Google under Larry Page is uber aggressive, and the latest salvo comes in the form of EmailIntervention.com, a slick website that enables you to do an intervention with your Yahoo, Aol and Hotmail-using friends and family members. You know, the ones who constantly have their emails hacked. Among web-based email services, Gmail remains in third place. According to Hitwise, Yahoo Mail was the fifth most-visited website in the U.S. for the week ending July 2, 2011, with Windows Live Mail (Hotmail) in 7th and Gmail in 10th place. 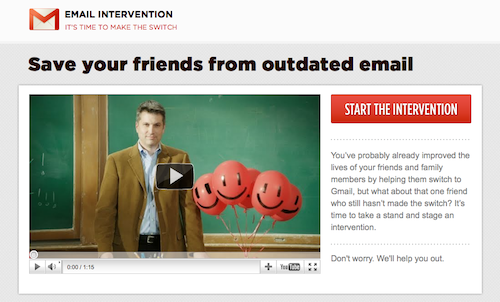 When you click on the red "start the intervention" button on EmailIntervention.com, you enter your name and Gmail address and the name/email of a friend. On the next page, you choose a customizable template: straightforward, concerned or outraged. You can then preview the email before sending it -- note the prominent red "switch" button. Google is encouraging people to report successful interventions by leaving a voicemail at 1-855-S2GMAIL. The discussion on Hacker News has not been kind. As Vivtek posted, "This is ham-handed and frankly not nearly as funny as I'm sure it seemed on campus."